Simon & Schuster Children's UK, 9781471120237, 224pp. 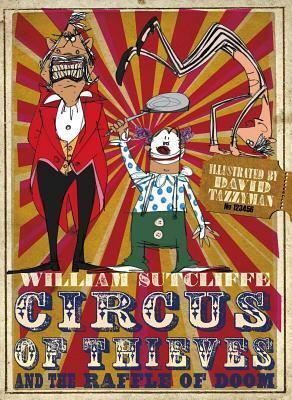 When a circus comes to a sleepy town, hilarious and wacky adventures ensue in this lively tale from bestselling author William Sutcliffe. Hannah’s life is boring, boring, boring! But when Armitage Shank’s Impossible Circus comes to town, Hannah’s world is turned on its head. She meets Billy Shank, his astonishing camel, Narcissus, and a host of other bizarrely brilliant members of the circus. But all is not as it seems; Armitage Shank, evil ringmaster and Billy’s surrogate father, has a dastardly plan involving light-fingered thievery…can Hannah and Billy to stop his sinister scheme before it’s too late? A brilliant mix of slapstick humor and wordplay, William Sutcliffe’s debut children’s novel—brought to life by the energetic illustrations of David Tazzyman—is a must for fans of Andy Stanton, David Walliams, and Roald Dahl.